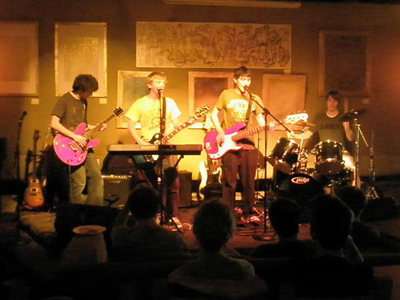 NinetyNineNorth is an alternative rock band formed by lead guitarist Pat Sabol and drummer Paul Narrigan in 2007. The band was completed with the additions of John Bucaccio on bass, Pat Hicks on rhythm guitar and Grayson Fitzgerald singing lead vocals. They have since played shows in their hometown of Wayne, PA and surrounding towns such as Ardmore and Allentown. Recently they finished a four-song, self-titled EP which they recorded in Pat Hicks’ home studio. On tracks from their EP such as "Awake" and "Until the End," NinetyNineNorth shows off their energetic and catchy style of songwriting which is filled with pleasing vocal harmonies and melodic riffs. The band's sound is heavily influenced by bands such as Rise Against, Saosin, Thrice, and Brand New. They continue to play shows and record music with the intent of releasing their first full length album later this year..
"We want you! Call 610-650-8450 to enter the battle. Ask for Nick." Click her for directions to find Sports Extreme! VIP with waitress service $25.